This week's topic in our super Summer Science series is Astronomy -- learning about the phases of the moon, star contellations and the wonders of the night sky! Inevitably, the kids will ask us: "How many stars are in the sky?" or "Why do the stars shine at night?" plus a million other variations of those impossible-to-answer questions. It's all part of the scientific inquiry process -- being intrigued enough to ask the questions and then heading off to find the answers! Introduce your kids to the idea of astronomy by reading a book or two from our reading list and then construct some fun marshmallow constellations for each of your favorite star groups! We've included affiliate links for all of the books and items so you can easily find more information on each one. Top it off with an evening walk to see if you can spot any of cellestial animals that you read about in the story. Our Stars is a great book that introduces the stars to younger children. The simple words and bright illustrations encourage kids to look up and give more attention to the night sky. Great for preschoolers. The Big Dipper (Let's-Read-and-Find-Out Science 1), part of a highly recommended science series, this book does a wonderful job of introducing constellations to the youngest astronomers! Learn how the stars 'move' in our sky, the names of the various stars that are part of the big dipper and how to find the North Star. Perfect for kids ages 4 - 8 years. Glow-in-the-Dark Constellations is such a fun book and I love the layout! First, it discusses each constellation in detail including the story of how each was named and the stars found in their structure. It also shows where the constellation can be found in the northern and southern hemisphere and answers some of those tough questions, such as "Why do constellations appear in different places in the night sky during the year?" An excellent resources for kids ages 6 - 10 years. The Stars is a perfect book for older readers who will enjoy the star charts and detailed information about the constellations in this great book. Readers will also learn about the seasonal movement of the stars, information about black holes and other areas of our solar systems and facts about each of the planets. Best for ages 12+. 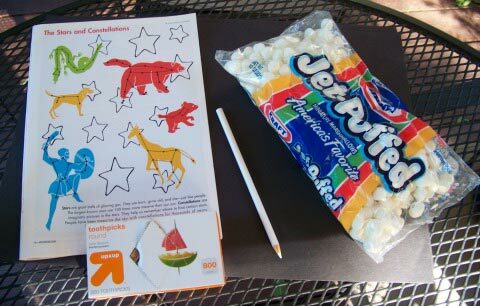 A fun (and tasty) way to learn more about the stars -- construct marshmallow constellations! Visit Mr. Printables to find a copy of the summer constellations map or use this set of Constellation Knowledge Cards so you can see the star patterns for each one. 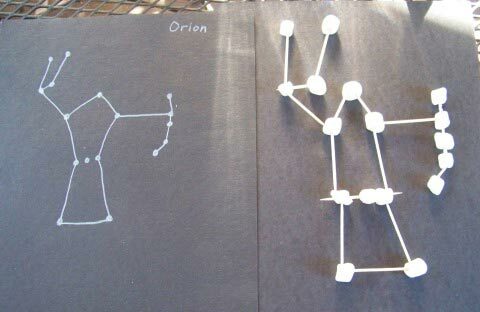 Either print out or draw the constellations you will create (we used black paper with white colored pencils to draw ours). Use dots for each of the stars and lines to frame the constellation's shape. We decided to build Orion, one of the most recognized star groups and also one that is visible around the world. 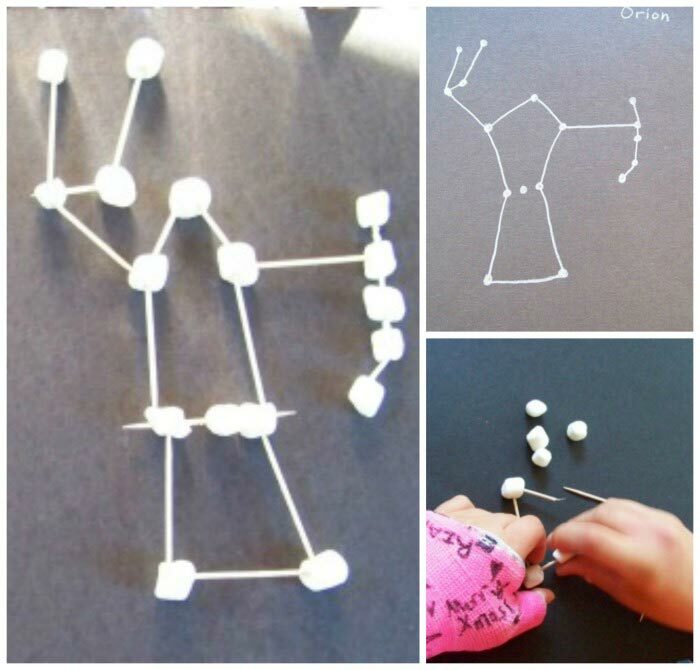 Construct the star constellations using the mini-marshmallows and toothpicks. Use a marshmallow for each of the stars and connect them with toothpicks so they resemble the outline of the star group. You may have to break some of the toothpicks in order to make shorter star connections as you build as we did for Orion's belt above. Instead of cooking them on a stick, they can be melted over the fire or grilled in tin foil and then spread onto your graham crackers. You'll probably need a star chart or an app to find many of the constellations. 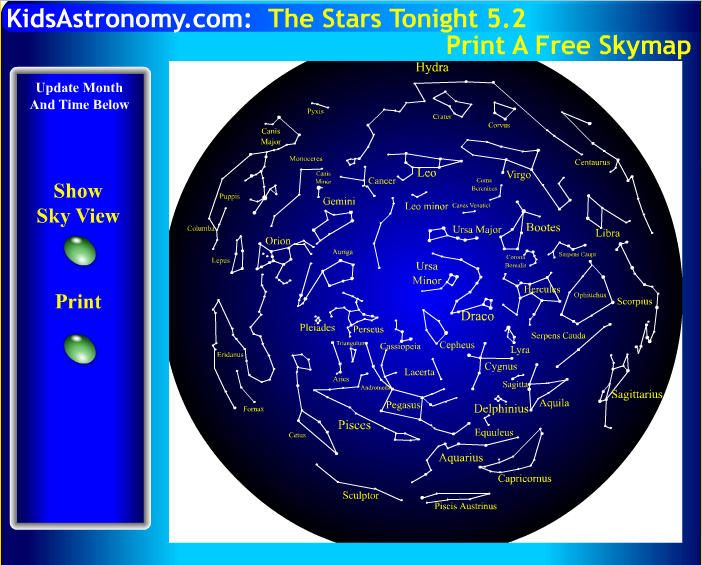 Visit Kids Astronomy to print a star chart for your area. If you'd rather go high tech (and have older kids), download an app for your phone that will help you locate each of the constellations. These can be really amazing -- you hold your phone up to the sky and it almost find the constellations for you! If you have an iPhone, try the Sky Guide app. For Android phones, look at the StarChart app (may not work on newer phones). Make your own star constellations to hang on your wall with this Glow in the Dark Stars kit . Our kids have had theirs hanging in their bedrooms for years and they still 'light up' each night! And head over to Inspiration Labortories for a fun science activity exploring the Earth, Moon & Sun. 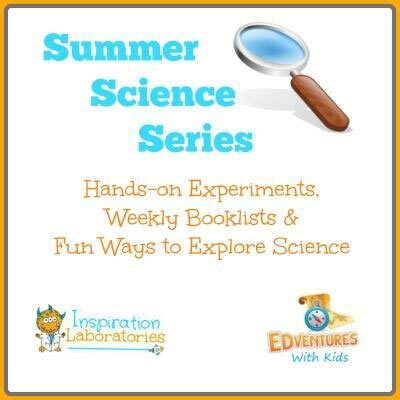 Be sure to visit more of the awesome book lists & activities for all the science topics! Does your Food Sink or Float?